John McCormick started this group in 1966. On an April evening in 1965, at the age of 13, John "snuck-in" the back door of the Armory and watched Myron Lee & the Caddies. The connection with rock & roll was immediate and concrete. In reality and fact, "Something New" was born in 1966, however the group's present moniker officially came about in the summer of 1976. The two remaining founding members (McCormick and Mark Kimmel) did not care for the two different group names that had been used since '66, and finally settled on "Something New" - which they are still using today. 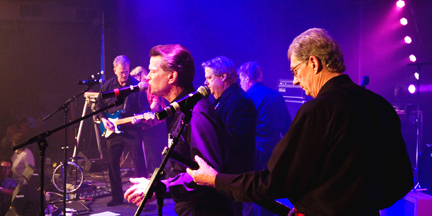 The group has performed countless shows over a 6 state region that went from Omaha, NE to Bismark, ND; Cedar Rapids, IA to Gillette, WY; from Redwood Falls, MN to Deadwood, SD; and beyond. They have been hired to be the opening for several major acts such as: The Four Freshmen, The Del Vikings, The Diamonds, Three Dog Night, Survivor, and more. Over the years the group continued to evolve, and over the decades literally dozens of members have successfully passed thru the group. Today's line-up includes original members McCormick and Kimmel, Helen Mogen, Randy Woods, and Brian Oakleaf. After all these years, the group looks to a bright and continuing future; seeing old friends, meeting new friends and offering a worthy performance and continuing success.